NOAA Fisheries has agreed to complete a BiOp and incidental take statement for its Columbia River Basin hatchery programs, as part of a settlement that would free federal funding for the programs. The deal, reached Aug. 2 in Wild Fish Conservancy v. National Marine Fisheries Service [16-cv-00553], requires the U.S. Department of Commerce to withhold Mitchell Act funds until NOAA Fisheries, also known as National Marine Fisheries Service, completes the studies. In the stipulation, NOAA Fisheries says the BiOp and take statement will be completed between Oct. 1 and Dec. 1 of this year. The case was filed in March in the U.S. District Court for the District of Oregon. The conservancy argued that 10 Mitchell Act hatchery programs in the lower Columbia River are harming wild fish, and not helping them as intended by the act. The programs are designed to provide harvest rather than to maintain naturally spawning fish populations, the group's complaint says. The delay for most of the 63 Mitchell Act hatchery programs operating from 34 facilities is expected to be several months. Funds are usually available in July or August, according to NOAA spokesman Michael Milstein. But for the 10 lower Columbia River programs that are the subject of the litigation, operational and maintenance monies will not be disbursed until the plaintiff's motion for a preliminary injunction is resolved. Although the stipulation does not set a specific date for a hearing on the injunction, the BiOp and briefing schedule--affirmed by U.S. District Judge Michael Mosman--will likely push resolution of the case well into 2017. Four hatcheries operated by Oregon and Washington departments of fish and wildlife--Big Creek, Bonneville, Klaskanine and Washougal--house the 10 programs. Congress appropriates Mitchell Act dollars to the Commerce Department and NOAA Fisheries, which in turn dispense funds to more than half of the Columbia basin's hatcheries. BPA is also a major source of hatchery mitigation funding in the basin. Wild Fish Conservancy contends NOAA Fisheries has not consulted the public or other agencies about hatchery operations, as required by the Endangered Species Act. It says the last consultation was 1999, and since then, additional Columbia River salmon and steelhead species have been protected under the ESA. About 80 percent of the basin's salmon and steelhead are of hatchery origin, which the complaint says is a problem because salmonids "reared in a hatchery environment become less fit to survive and reproduce in the wild." It also argued that hatchery fish "released en masse return as adults to interact genetically with wild fish, thereby introgressing their domesticated genes into the wild population and reducing wild productivity." Other fisheries groups have disputed that claim and www.newsdata.com/fishletter/354/2story.html criticized the lawsuit as hurting recovery efforts. In the Columbia basin, more research dollars are spent on fish propagation than any other category of scientific study related to fish and wildlife recovery. Among the propagation research questions being addressed are wild-hatchery fish interactions, including genetic interactions, competition for food, population density and more. 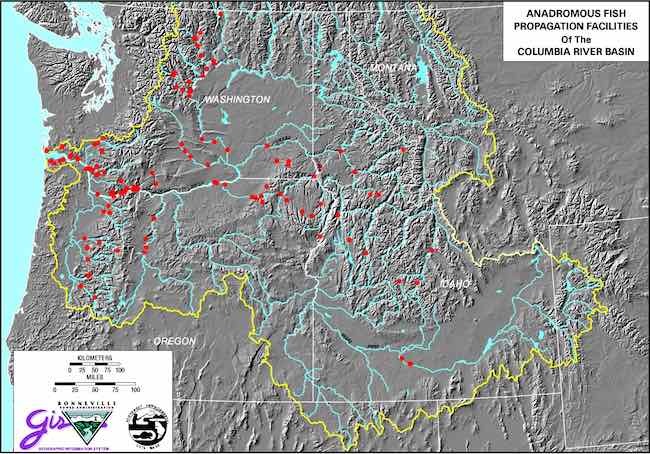 Excerpt from BPA's Columbia River hatcheries: an evolving role September 2010 Because ESA focuses on the wild runs, it raised questions about the broader role of hatcheries in the Columbia River system. Questions remain today about both the reproductive viability of hatchery fish and their effect on the salmon ecosystem. There are four key issues. Historically, hatchery fish have not reproduced as well as wild fish, raising concerns that interbreeding between hatchery and wild fish could weaken the stocks. Hatchery fish introduced in numbers may compete with wild fish for food and habitat. If there's a big size difference, the larger may out-compete the smaller. Hatchery fish whose ancestors originated in a different stream could overwhelm native runs, reducing the genetic diversity of salmon. Uncertainties remain about supplementation hatcheries' long-term ability to spur naturally sustained salmon production.